Upper Merion Township administrative offices are located at 175 West Valley Forge Road, King of Prussia PA 19406; phone: 610-265-2600. Photo: Isaac Potts House (Washington's Headquarters), ca. 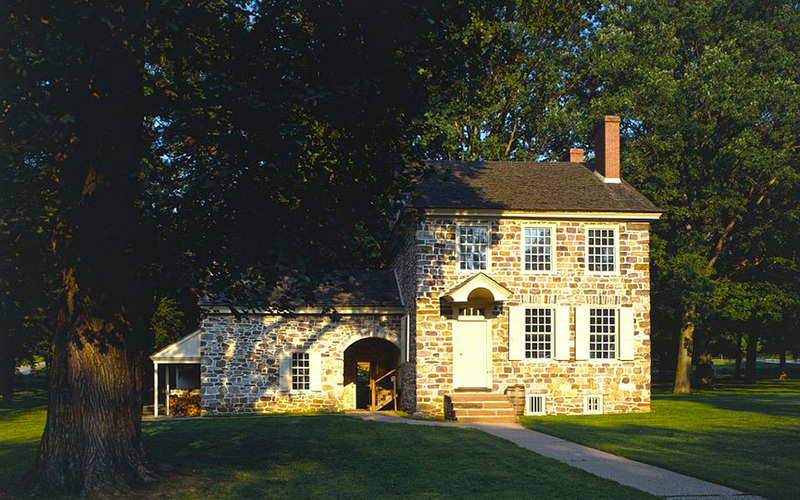 1773, Valley Forge National Historical Park, Montgomery County. Listed on the National Register of Historic Places in 1972. It is also a contributing resource in the El Cid Historic District. Photographer unlisted, Historic American Buildings Survey [HABS PA-1171], memory.loc.gov, accessed October, 2013. The municipal is also home to the township public library. The township is server by the Upper Merion Area public school district. Upper Merion is bordered on the north and east by the Schuylkill River, a tributary of the Delaware River. The majority of the land within the township is gently sloping with low to moderate grades. The southwestern portion of the township, however, is hilly with a significant portion with grades in excess of 15%. Geologically, the township contains a large band of underground limestone formations that have historically been used for quarry operations. It also contains a formation that has been prone to sinkholes, which has presented challenges for development in certain areas. Large portions of the township are heavily wooded, in particular, the banks of the Schuylkill River and the low-density residential areas south of the Schuylkill Expressway (I-76). Another significant natural area is Valley Forge National Historic Park, which contains over 1,300 acres of mostly undeveloped land.